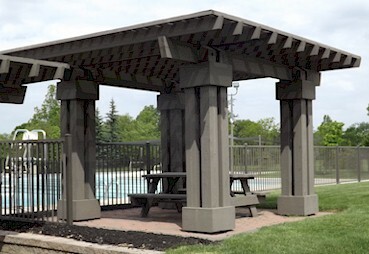 Pool Shelter Reservation - Muirfield Association, Inc.
Are you thinking about planning a birthday party, family gathering, or other event at the pool? 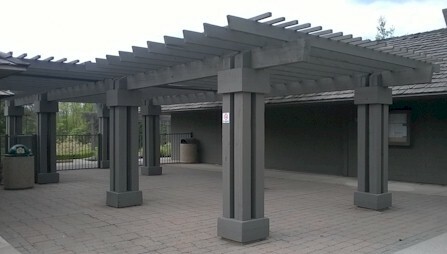 If you'd like to guarantee a pergola shelter is available for your event, the Association pools have a total of five shelters available to reserve! Keep reading shelter reservation information below or go to available shelters (includes pricing), make a reservation request, or checking availability, reservation questions and contact information. 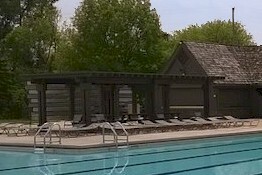 Of course, residents are always welcome to bring guests to the pool and use any shelter that is currently open. If you plan to bring a group of 20 or more, please call the pool in advance (preferably one week in advance) so the pool can add extra staff if needed. 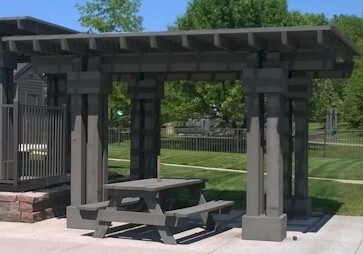 There are five pergola shelters that can be reserved; four at the Holbrook pool and one at the Glick pool. 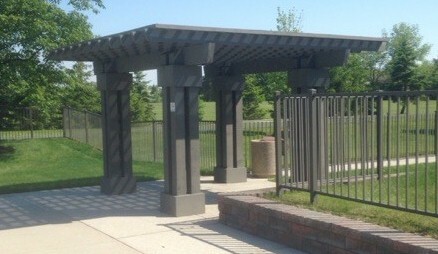 All of the shelters have a covering that makes them partially shaded. None are fully shaded or rain proof. All shelters are furnished with at least one table plus chairs. The amount of tables and chairs depends on the size of the shelter. Only Muirfield residents may reserve a shelter. Only residents in good standing may reserve a shelter or use the pool facilities. Reservations are accepted on a first come, first served basis. Reservations must be made at least one week (7 days) in advance. The resident organizing the event (the "organizer") must give an anticipated headcount at the time of reservation. A space is available on the reservation form. The purpose is to ensure adequate staff is present. o	During any pre-planned pool event such as a swim meet or other event. Outside food and beverages are welcome with the exception of alcoholic beverages. Attendees are welcome to visit the concession stand. A number of pizza companies deliver to the pools. Bring a cooler if food or drinks must be kept cold. Staff may inspect cooler for items not permitted (alcoholic beverages and/or glass.) Pool staff cannot store or refrigerate food or beverages for events. Organizer must bring all plates, napkins, utensils, cups, etc. as needed. Staff is not able to provide these items. Don’t forget your serving utensils! No alcoholic beverages are permitted at the pool facilities or on Muirfield common ground at any time. If alcoholic beverages are brought to the facility, the event will be cancelled immediately and attendees will be asked to leave. All residents must present their current Muirfield photo ID card to gain entry, whether swimming or not. Unless otherwise instructed by the pool manager, the organizer must present a list of names of all non-resident guests beforehand to the pool staff. (This will enable guests to enter without the need for the organizer to check each one in as they arrive.) As guests arrive, the guest must tell the pool staff their name along with the event they are attending. Pool staff will check them off the list. At the conclusion of the event, pool staff will give the organizer the list of all non-resident guests who attended. The organizer must either present one guest pass per guest or pay $2 per guest who attended, whether those attendees swam or not. There is no fee for Muirfield residents or any attendee under the age of 2. Organizer must pay the rental fee and guest fees plus present guest passes at the conclusion of the event before leaving the facility. Passes and money cannot be turned in at another time. Cash or checks are accepted. The staff will provide tables and chairs at shelters (The number of tables and chairs will depend on the size of the shelter). Aside from that, the organizer is responsible for all set up and clean up of the event. If using decorations, organizer must bring all decorations and remove them at the end of the event. If using tape, only non-marring tape is permitted. No duct tape, staples, nails or tacks may be used. Crepe paper may not be used if it is raining because it will stain the shelter. Decorations may only be used at the site reserved; they can’t be used on other shelters, on the building, at the front desk or at the concession stand. Smoking and pets are prohibited inside pool facilities. There is no charge for the event if it is cancelled. All attendees must abide by the Recreation Facility Rules. View a map of shelters here. A list of available shelters at each pool with photos are below. Please note: several photos were taken before the start of the season and tables and chairs were not arranged yet. To determine if a particular shelter is open on your desired date and time, please call the pool at which you'd like to hold your event: 889-0837 (Holbrook) or 889-1504 (Glick). 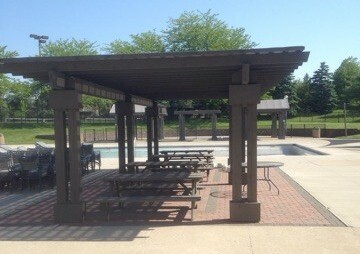 To request a shelter, download the Muirfield Pool Shelter Reservation Request form below, fill out the first two pages (the second two pages are for your reference), and bring the completed form to the pool where you would like to hold your event at least 7 days in advance. Blank reservation forms are also available at the pools. After the form is received, the pool manager will review the request. A member of the staff will contact you to confirm your event. Event is not considered approved until pool staff contacts you with verification. Reservations are only handled through the pools. The Association office staff can't process reservation forms and does not know shelter availability. 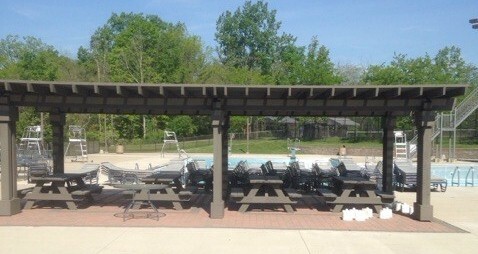 Only the pool can accept reservations, check availability, and answer questions. To check availability of a particular shelter or a particular date and time, call the pool at which you'd like to hold your event (numbers are listed below). We suggest checking availability before placing a reservation request. Because all reservations and pool events are handled by the pool manager, we regret that the Association office cannot assist with reservations or availability.